Did you know that weight-loss surgery can help with more than just weight? It can help improve conditions like diabetes and sleep apnea. Learn more about surgical weight loss from Dr. Ann Rogers, director of the Penn State Surgical Weight Loss program. Description – The video begins inside a room next to a window within the Penn State Milton S. Hershey Medical Center. Two individuals are standing together looking at the camera. From left to right is, Dr. Ann Rogers, director of Penn State Surgical Weight Loss and Scott Gilbert. Scott Gilbert – Hershey Medical Center, this is Ask Us Anything about Surgical Weight Loss I’m Scott Gilbert. You’ve probably heard statistics, an alarming 160 million Americans, if not more, are categorized as either overweight or obese. That raises the obvious question, what can be done to try to reverse this problem? For some, diet and exercise may be the best option, for others, surgical weight loss may be the best option. Here today to talk with us about that, Dr. Ann Rogers she is director of Penn State Surgical Weight Loss. Thanks for being here today? Dr. Ann Rogers – It’s great to be here, thank you. Scott Gilbert – So some people watching might be asking that question that I’m sure you get all the time, how do I know if surgical weight loss is for me? What are some of the good things that make someone a good candidate? Dr. Ann Rogers – So a lot of people feel alone in the world but they’re not. Five percent of all humans qualify for surgical weight loss. We tell by body mass index which is a comparison of height and weight. In simple terms, if you weigh approximately 100 pounds more than you should, you would qualify. Scott Gilbert – And when it comes the diet and exercise I mentioned before, those are options for some people but how do you know whether you’ve done that long enough and need to explore another option? Dr. Ann Rogers – Well, all of our patients have tried every kind of diet in the world prior to coming to our program, so many of our patients have been dieting since they were little children. Most people want to try diet and exercise first and, you know, eating right and exercising are important even if you’re going to have surgery, but it’s reasonable to try that first. Scott Gilbert – And in terms of demographics of people having surgery, it’s not just for adults there are some adolescents for whom it’s a good choice. Dr. Ann Rogers – Absolutely. We’re one of the few credited adolescent weight loss centers in the state. So we accept patients who are of adult size starting around age 15. Scott Gilbert – You’re watching Ask Us Anything About Surgical Weight Loss from Penn State Health, I’m Scott Gilbert along with Dr. excuse me Dr. Ann Rogers and we welcome your questions and comments you can enter them right in the comment field below this Facebook post and we’ll post them to Dr. Rogers. Whether you’re watching this live or either if you’re watching on playback, we’ll make sure we get an answer for you. You know, from the time you first express interest, what then happens? What’s that series of events that happens in terms of screening somebody and making sure that they are a good candidate. Dr. Ann Rogers – So we have live information seminars that patients can attend given by a surgeon and they can ask their questions and learn about the program and what we do, we also have an online seminar that patients can visit to view any time, take a little short quiz to show that they watched it and then there’s some paperwork we ask patients to submit one or two pages, and once we’ve had a chance to look over the paperwork, we call patients and get them right in the program. The program consists of visits with our dietitians to get nutritional education. There’s also a visit with our psychologists, some testing and evaluation to make sure patients are safe and stable. And then how long they remain in the program is mostly driven by insurance some insurers require three months and others require six. Scott Gilbert – Dr. Rogers mentioned a video we’ll post that link along with this Facebook post and also for more information the number to call about those seminars is 717 531 7260 again, that’s 717 531 7260. There are various types of bariatric surgery and procedures that can be done, can you walk me through those? Dr. Ann Rogers – Sure. The producer almost everybody has heard of is the gastric bypass that at one time that was the common operation for weight. Currently, the most common operation in the whole world is something called sleeve gastrectomy and that’s most of what we do. We still do the gastric bypass and we’re one of the few centers in the state it offers something that calls the duodenal switch procedure. Scott Gilbert – And so three different procedures, how do you determine which one is for an individual patient? Dr. Ann Rogers – Well, we ask patients to listen and learn about all the kinds of procedures while they’re in the program, and then when they meet with the surgeon based on their medical issues and their lifestyle, we agree together on what would be the best option for them. Scott Gilbert – And given that’s it’s not perhaps as common as the others, can you explain duodenal switch and what that involves? Dr. Ann Rogers – The duodenal switch includes having a sleeve gastrectomy where you make a narrow tube out of the stomach and remove the big stretchy part. And then it also includes a bypass of the intestines. So it’s really the only operation we have that can help really big folks get to an ideal body weight, but it’s really intended for people in the higher ranges of body mass index. Scott Gilbert – You’re watching Ask Us Anything about Surgical Weight Loss from Penn State Health, this is Dr. Ann Rogers director of the Penn State Surgical Weight Loss program and she welcomes your questions here. Again, whether you’re watching us live or on playback. And of course, we encourage to you share this information; share this post if you find this information helpful as you hopefully do. One of the questions I’m sure get from a lot of patients upfront is well, I would say I have a certain target weight I’ve love to get down to, but how much weight will I lose with this procedure? Dr. Ann Rogers – So we tell people on average with common operations like the sleeve or the bypass, they’re likely to lose about a third of their weight. Some people lose more; some may lose a little in less, in some ways it has to do how you use the procedure whether you’re eating right and exercising, whether you still have a metabolic rate and you can still burn calories, things like that. Scott Gilbert – I was going to ask you about that. After the procedure, how important is it that people take care of themselves after the procedure and don’t just expect the surgery to all their problems? Dr. Ann Rogers – Yeah, the surgery is in no way magic and it’s really not the easy way out, and some people tell our patients they’re talking the easy way out, it’s not. It’s a total lifestyle change and if they don’t incorporate eating right and exercising, the operation won’t be as effective. Scott Gilbert – Is that part of that screening beforehand to see what the likely hood is that they’ll stick with that program after the fact? Dr. Ann Rogers – To some extent. Yeah, we educate patients as much as possible about how important their own lifestyle changes are going to be. Scott Gilbert – It’s a pretty major procedure any of the ones you mention, so as with any surgery there’s risk of complications, can you talk about how you try to mitigate those? Dr. Ann Rogers – Well, the great thing is that since about the year 2000, most bariatric procedures have been laparoscopically, meaning through various small incisions. So since that change over it’s gotten to be extremely safe. In fact, the complication rate of bariatric surgery is lower than that of things like hernia and in a gull bladder surgery. So the hold horror stories people used to tell just are not true anymore. Scott Gilbert – You’re watching Ask Us Anything about Surgical Weight Loss from Penn State Health Scott Gilbert alongside Dr. Ann Rogers she’s director of Penn State Surgical Weight Loss. You know, I was reading in the news that there was a study out of Cleveland Clinic recently that explored the benefits of surgical weight loss specifically, those who have uncontrolled diabetes. Any surprise there on how it’s not just it didn’t just seem to have improvement in their weight, but also dealing with a very serious disease? Dr. Ann Rogers – Well, there was no surprise for me, but I think there were many surprises for the general public and for a lot of our internal medicine doctors to see that this is not just a valid option for the treatment of diabetes, it may be a preferred option for a lot of patients with diabetes. And the study basically showed that gastric bypass and sleeve gastrectomy were both far more effective at reversing or at least controlling, diabetes compared to intensive medical management. Scott Gilbert – Sure. So those conditions brought on by weight and there are some other conditions it helps with too, correct? Dr. Ann Rogers – Many, many. A lot of those weight associated conditions, like, sleep apnea, high blood pressure, high cholesterol, joint pains, there are many weight associated problems that tend to get better after the surgery. Scott Gilbert – All right. 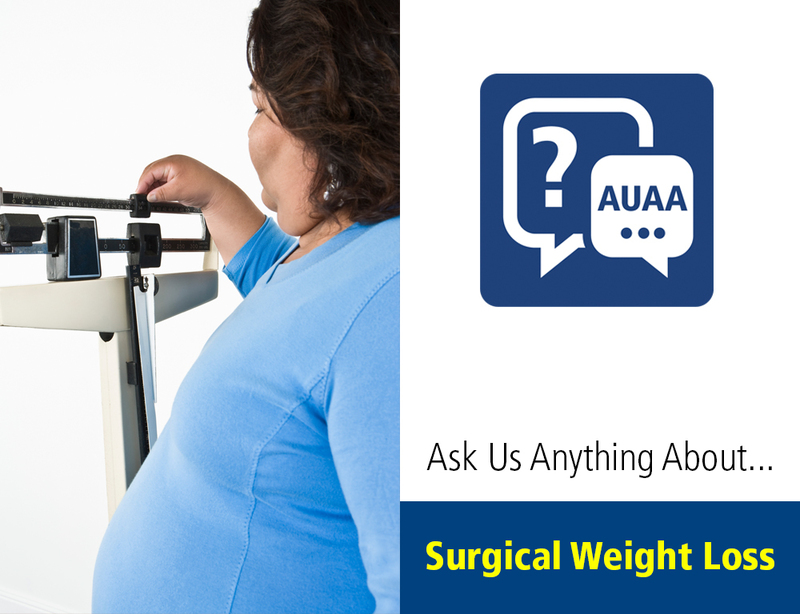 You’ve been watching Ask Us Anything about Surgical Weight Loss from Penn State Health. Again, we encourage you to share this post on your Facebook page help us get the word out about this good information. And of course, whether you’re watching it now or on playback, you can ask your questions and we’ll make sure we’ll get some answers for you. And make sure you follow our Facebook page the Milton S. Surgical Medical Center Facebook page so you can get notifications about future editions of Ask Us Anything About. Thank you very much for watching Ask Us Anything about Surgical Weight Loss from Penn State Health.